The costal cartilages are made up of hyaline cartilage and give elasticity and mobility of the chest wall. 1st to 7th cartilages attach the respective ribs with the lateral margin of the sternum and from 1st to 7th they develop lengthwise. 8th to 10th cartilages are attached together with the lower margin of the cartilage superiorly at their anterior points and from 8th to 10th there is an ongoing reduction of length. 11th and 12th cartilages end in free directed extremities. They are shafts of hyaline cartilage that join the ribs and the sternum. There are 12 ribs distributed into three categories according to their connection with the sternum. As their costal cartilages join directly with the sternum, the first seven ribs are referred to as true ribs. As their costal cartilages do not join directly with the sternum, ribs eight to ten are referred to as false ribs. They directly join with the cartilage superiorly. As their costal cartilages do not join the sternum at all, ribs eleven and twelve are referred to as floating ribs. The costal cartilages are significantly involved in the elasticity as well as mobility of the firm thoracic wall. They also facilitate crucial respiratory movement, without which the gaseous exchange in the lungs may get weakened. The costal cartilages lose their elasticity and get ossified to a certain degree in old age due to superficial calcification. All twelve pairs of ribs terminate anteriorly in a costal cartilage. A typical rib constitutes a curved shaft having anterior and posterior ends. The anterior end is continuous with its costal cartilage. The posterior end joins with the vertebral column and is symbolized via a head, neck, as well as tubercle. Portion of the bony structure of the neck as well as the thorax is created by the manubrium of sternum. The superior side of the manubrium is stretched out laterally as well as has a distinct and palpable notch in the midline referred to as the jugular notch a.k.a. suprasternal notch. For articulation with the clavicle on all sides of this notch is a large oval fossa. A facet is present for the attachment of the first costal cartilage on each lateral surface of the manubrium directly inferior towards this fossa. A demifacet is located at the lower end of the lateral margin for joining with the upper half of the anterior end of the second costal cartilage. The lateral margins of the body of the sternum possess articular facets for costal cartilages. Each lateral margin has a demifacet superiorly in order to join with the inferior aspect of the second costal cartilage. Four facets are located Inferior towards this demifacet in order to join with the costal cartilages of ribs III to VI. A demifacet is found at the inferior end of the body of the sternum in order to connect on the seventh costal cartilage with the upper demifacet. The inferior end of the body of the sternum and the xiphoid process are connected to each other. The xiphoid process is the smallest portion of the sternum. A demifacet is found for joining with the inferior end of the seventh costal cartilage on each side of its upper lateral margin. The upper seven costal cartilages and the sternum are joined together with the sternocostal joints. Interchondral joints are found in the middle of the costal cartilages of adjacent ribs, mainly among the costal cartilages of ribs VII to X. However it may also include the costal cartilages of ribs V and VI. The eleven pairs of external intercostal muscles extend nearby the thoracic wall from the tubercles of the ribs towards the costal cartilages, where every layer proceeds as a thin connective tissue aponeurosis referred to as the external intercostal membrane. The eleven pairs of internal intercostal muscles spread out from parasternal zones, where the muscles travel in the middle of adjacent costal cartilages posteriorly towards the angle of the ribs. The transversus thoracis muscles travel superiorly and laterally in order to attach within the lower margins of the costal cartilages of ribs III to VI. The pectoralis major has a broad starting point which consists of the anterior surfaces of the medial half of the clavicle, the sternum, as well as associated costal cartilages. The subcalvius muscle emerges from rib I at junction in the middle of rib as well as costal cartilage. On each side, the internal thoracic artery lies posterior towards the costal cartilages of the upper six ribs and approximately 1 cm lateral towards the sternum. The internal thoracic arteries produce perforating branches that travels directly forward in the middle of the costal cartilages in order to supply structures external towards the thoracic wall. The intercostal nerves end as anterior cutaneous branches that arise either parasternally in the middle of adjacent costal cartilages or on the anterior abdominal wall lateral towards the midline in order to supply the skin. At the level of the intervertebral disc in the middle of vertebrae TV and TVI. Opposite the left margin of the sternum as well as posterior towards the third left costal cartilage. The ascending aorta arises at the aortic orifice at the base of the left ventricle, which is on same level as the lower margin of the third left costal cartilage. The ascending aorta proceeds towards the plane of the second right costal cartilage. superior vena cava is vertically positioned and arises posterior towards the lower edge of the right first costal cartilage. The brachiocephalic veins join in order to create the superior vena cava posterior towards the lower margin of the costal cartilage of the right first rib. For describing the anatomical position of heart identification of its borders is necessary. The upper limit – goes as high as the third costal cartilage on the right side of the sternum as well as the second intercostal space on the left side of the sternum. The right margin – spreads outwards from the right third costal cartilage till near the right sixth costal cartilage. The lower margin – extends from the sternal end of the right sixth costal cartilage till the top in near the midclavicular line the fifth intercostal space. The parietal pleura superiorly protrude over the first costal cartilage. In the anterior view, the horizontal fissure on the right side trails the outline of rib IV along with its costal cartilage. On both sides, the outline of rib VI and its costal cartilage are followed by the oblique fissures. The transpyloric plane is a horizontal plane that is located around midway in the middle of the jugular notch as well as the pubic symphysis and traverses the costal margin on each portion approximately at the ninth costal cartilage. 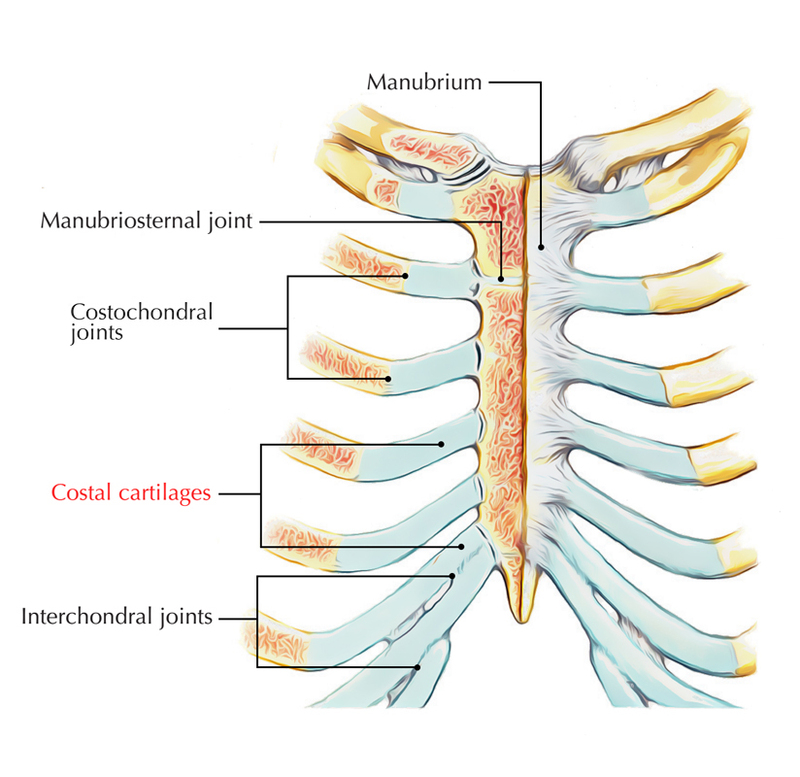 The costoclavicular ligament is attached below towards the upper and medial portion of the cartilage of the first rib.